Across America, but most pervasively in small industrial towns across the country, decades of excessive opioid prescriptions have led to a national epidemic of heroin overdoses. In no place is this struggle on view more pointedly than in Huntington, West Virginia, an Appalachian city with an overdose rate 10 times the national average. When a film focuses on one of the nation's most vilified drugs, how can a filmmaker break through the cynicism and judgment audiences often place on those unable to free themselves from its grasp? One way is the road taken by Peabody Award-winning filmmaker Elaine McMillion Sheldon in her Oscar-nominated short documentary, Heroin(e). She lights a path towards recovery by using three beacons of hope and compassion in the city of Huntington— its fire chief, Jan Rader, who spends many days and nights responding to overdose calls to administer the oftentimes controversial drug naloxone to save people who might otherwise die; Judge Patricia Keller, who presides over Huntington's drug court, handing down empathy along with orders; and Necia Freeman of Brown Bag Ministry, who hands out free meals to the women selling their bodies for drugs. With an unflinching observational lens, Sheldon's film highlights three women working to change Huntington’s future and break the devastating cycle of drug abuse one life at a time. Earlier this month, I spoke with Sheldon by phone about her powerful short film. Your film is not really about reportage. It feels so much more personal. What was your exposure to the opioid epidemic and to heroin use prior to making this film? Elaine McMillion Sheldon: I grew up in Logan, West Virginia. Just down the road from where I went to grade school, there was a "pill mill" with a constant line around the corner of people waiting to get their prescription of OxyContin or Percocet. Getting prescribed opioid medications for pain was originally how the epidemic started in my neck of the woods—when towns like Kermit, West Virginia, which has a population of less than 400, was awash in nine million opioid pills in two years in a single pharmacy. Just looking at my cheerleading squad in middle school and my high school graduating class reminds me how many friends and classmates ultimately became addicted, lost their children or have overdosed. I have friends too who have found their way into long-term recovery, and I'm hopeful that as a country we will find our way out of [this epidemic]. I myself have never struggled with addiction, and I'm very lucky to say that. I think all of us are just one really bad injury away from potentially getting hooked. In a film focusing on heroin, the substance isn't on display. In fact, the viewer never sees it at all. Was that a conscious choice on your part? Oftentimes the tactic to showcase this problem is some type of dramatic scene of users prepping the drug and shooting it up. With Heroin(e) I was trying to open up the conversation for people who have a hard time relating to that kind of portrayal. These are women who don't judge people, who see [opioid addiction] as a disease that needs to be treated as such and are trying to help people on a daily basis. The film has been able to reach church communities that have been doing narcan training and instruction, passing out clean needles, etc. Screenings have been hosted in prisons and rehabs and people’s homes. It's helped turn the page on the shame based conversation around addiction into a dialogue about how can we fight a public health crisis. This crisis makes headlines now, but when we started almost three years ago, a lot of people weren’t even sure what the opioid crisis was. Have you received an emotionally charged response from people after they've seeing the film? I have, but more importantly, the women profiled in the film have. It's usually the filmmaker receiving a majority of the comments, but the film has resonated with so many people who have been offering incredible letters of support from all around the world to [Jan, Necia and Judge Keller]. People who have been in recovery for 20 years or mothers who have lost children or fellow EMS and first responders are reaching out to say, "I want to thank you." Jan Rader, the fire chief, was invited to attend the State of the Union address recently with Senator Joe Manchin of West Virginia, and all three women have been able to speak at the Obama Foundation Summit. These are three women leading the charge. They've been in the trenches so long doing this work without a lot of support, and the reactions to the film have validated their work. There's not a lot of funding and help for people suffering from addiction, so being part of the national conversation is awesome for me and for them. Was this film intended to be feminist? The lens is narrowly focused on three very strong and compassionate women. I was raised by strong women in Appalachia, women who worked full time jobs, raised families, grew their own food. They never thought of themselves as feminists. It is always my hope that in some way my films inspire others from rural parts of America to tell their own truths. Appalachia is home to a lot of strong women, like Jan, Necia and Judge Keller. I hope young women see them and the leadership they represent, their boldness and their fearlessness, and are inspired. Clearly, your personal commitment to this part of the country and its people comes through in your work. How do you sustain that kind of dedication to projects where you’re on assignment for a large content producer like PBS or The New York Times? I've been really lucky that a majority of the things I've worked on I've pitched myself. It's one of the beauties of working from a place that is underrepresented and often misrepresented. I can bring stories to content publishers that they haven't heard before. Stories about Appalachia are the ones that have my heart, though. I put a lot of love into work that I do there because I have such an interest in seeing it not die. It's a hard place to live. It's losing young people. There needs to be a greater effort to rejuvenate it. Before I watched your film, I was unfamiliar with the concept of drug courts to provide treatment, guidance and resources to people in addiction recovery. I found them so empowering in the film. Tell me a little more about them. Everyone who's a drug court participant is proud to be a drug court participant. No one feels shamed. And that is so cool. Let's say a person needs a new pair of shoes to go to a job interview. Judge Keller will ask, "Who can help with this?" It comes down to that micro-level of helping people. Everybody I've seen who goes through drug court is so grateful for it, but unfortunately drug courts are not supported at the state and federal level as they should be. In West Virginia, for example, being a drug court judge is a volunteer position. Judge Keller herself doesn’t even get paid to be there. She’s a family court judge, volunteering her time. 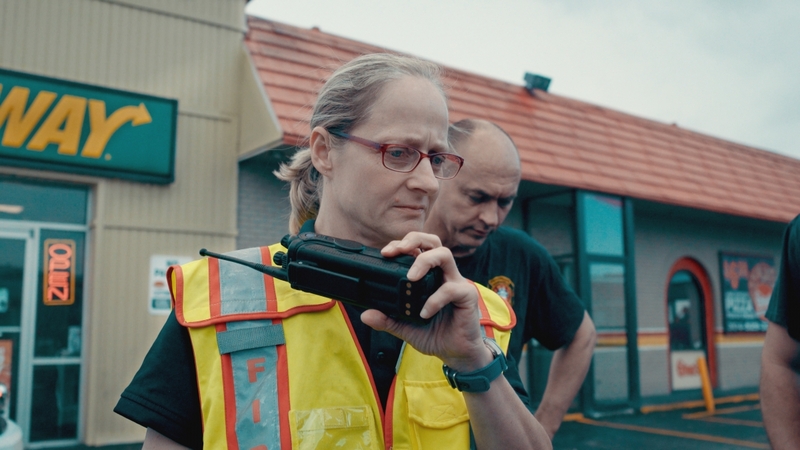 There’s a pivotal scene in Heroin(e) where Fire Chief Rader faces resistance during a town meeting about narcan and naloxone treatment, where she's asked to justify why she is saving the lives of people who are seen as a burden to the community. It was a moment of incredible tension in the film. Those life-saving medications are enabling people to keep using heroin, and the ethical complexity of this is a major point of contention. Many people quote that scene when they talk about changing opinions or changing mindsets, saying it made them think differently, made them think about the human behind the statistic. Jan says she became a first responder to save life and property; her role is not to play God and choose who lives and dies. I think one of the things people worry about is, How do we afford medications like naloxone in our communities? Distribution companies responsible for the influx of opioids pills that flooded our state, as part of their [legal] settlements are now providing narcan and naloxone to communities in West Virginia. That's just a start of the responsibility these companies have to communities affected by the opioid epidemic. The way I see it, if we allow people to use dirty needles, overdose and die, it becomes more of a public health crisis for everyone. Instead, we can find ways to provide a safe space to have a conversation about recovery. This country has treated addiction and people suffering from addiction as criminals for its entire history, so this is not going to change overnight, but I think we've started a new conversation, one that is long overdue. Are you working on any new projects related to this topic? My husband, Kerrin, and I have been working on a feature coming out later this year on a similar theme. I can't miss an opportunity to give a shout-out to Kerrin, who is my DP and producer on the two films. I couldn't make any of this work without him. In the new film we're able to explore the environmental challenges of addiction, even when there's access to rehab. The film touches on a lot of economic generational poverty and addiction issues. We're always developing projects, but not every topic can be turned into a feature, so sometimes we just do an Instagram story and a Facebook post. My husband and I have been trying new ways to have a quicker turnaround. Making films takes so long, so trying to think of different forms of media just to get stories out there to help people is important. Is it a struggle to decide when to make those smaller projects and when to develop larger productions? The struggle is wanting every project to be out there immediately, to reach as many people as fast as possible because you've already spent a lot of time on a story that needs to get out into the world. I think the bigger challenge is deciding which medium is right for the story. One of our other films, called Hollow, is an interactive documentary. It relied on data visualization, animation, documentary shorts and historical archives. Blending all those mediums into that one project was the best way to navigate that particular story. Were you anticipating the national conversation around the #MeToo movement to coincide with the film's release? No. The film came out at a moment that makes the women in the film especially poignant. But you really can't plan for those things. Sometimes you just get lucky that people are paying attention. And unfortunately that luck coincides with a lot of people suffering. That's the hard part. These women have been talking about issues around sexual assault for a while, but not as part of a movement; that it's so relevant to the current conversation will hopefully amplify their life's work. The conversation around the #MeToo movement doesn't often include women from all classes, races and lesser-known parts of the country. The women in the film we see being helped by Necia's Brown Bag Ministry oftentimes were sexually abused as children, but because they're from lower-income families, we don't like to talk about it; that's the reality. We make the work to start these much-needed conversations to help people heal and use this platform to bring the conversations back to solutions. Has Netflix been a good partner on this project when it comes to fulfilling that mission? Absolutely. Netflix made this film available for educational use. People can screen it to as big of an audience or as small of an audience as they want, as long as they don't charge admission. Anyone wanting information about hosting a screening can get access to it online. We made a field guide for people who want to host a screening that gives discussion topics and a Q&A. Especially leading up to the Oscars, we'd like to keep that conversation going. On that note, are you going to attend the Oscars? Yes. There aren't a lot of girls who grew up in the coalfields of West Virginia who get nominated for an Oscar. It's not why we make the work, but it's truly an honor. My husband and I are really hoping to get tickets so all three women profiled in the film can be there with us. The best way to go would be with them. Heroin(e) will be screening at IDA's DocuDay at 3:30 on Saturday, March 3 at the WGA Theater in Beverly Hills, and is currently streaming on Netflix. Sarah Haufrect is a freelance writer and full-time communications director for an LA-based education philanthropist, for whom she associate-produced the recent documentary Teach Us All. Her writing has appeared in Salon, TheMighty, OptionB.org and Psychology Today, among others.